What are your thoughts when worship comes up in a conversation? It is the music? Or do you think it’s the sermon? Most of the time, the focus in worship is toward the music. It is important to remember that there is more to a worship service that just the music portion. There are numerous methods in which we convey our worship to God. In this post we will take a look at five individual elements that gives the worshipper a fuller experience in the worship service. These items include the following: Singing, Praying, Preaching, Giving and Communion. To begin we will cover singing. Bob was a new Christian and this was his first time at a church weekend retreat. The very first activity at this event was singing worship songs. Bob was very intimidated with singing out loud. However he sings more confident now. These words encouraged Bob to sing. badly! But though the years he discovered the only way to improve was to practice. The problem was the only place he could rehearse was during the church service. It took a while for Bob to gain confidence by focusing on the One he sang to. With this perspective he was not worried with his surroundings. This shift in view made him worship better. Eventually, Bob bought a songbook and began singing during His devotional time. Without the aid of instruments the weakness of his voice was very apparent. But again, taking the focus off his singing voice and concentrating on offering the songs to God was awesome. The amazing thing is that Bob enjoys singing more than ever. He discovered that by raising his voice to the Lord and hearing others do the same is a most tremendous experience. Most would concur that worship incorporates the act of singing. This is a physical action that provides worshippers to express though songs what is their heart. Sing though similar to talking is quite different. Perhaps the most special thing about singing is the ability for a group of people to verbalize their worship in unison. It is singing as a congregation that we can show thanksgiving, gratitude and praise, Everyone can at the same time communicate to God. The entire church can make an offering at the same time. Singing can provide the worshipper with a greater ability to use emotions. Music has the most special property to cause moods and emotions though the various combinations of melody, tempo. Music is a language all its own. Matthew 6:7-15 But when ye pray, use not vain repetitions, as the heathen do: for they think that they shall be heard for their much speaking. Be not ye therefore like unto them: for your Father knoweth what things ye have need of, before ye ask him. After this manner therefore pray ye: Our Father which art in heaven, Hallowed be thy name. Thy kingdom come, Thy will be done in earth, as it is in heaven. Give us this day our daily bread. And forgive us our debts, as we forgive our debtors. And lead us not into temptation, but deliver us from evil: For thine is the kingdom, and the power, and the glory, for ever. Amen. For if ye forgive men their trespasses, your heavenly Father will also forgive you: But if ye forgive not men their trespasses, neither will your Father forgive your trespasses. A lot of our praying is like that. The words we use are empty. We use the same phases over and over again. Words we used many times. Prayer is simply communication with God. Here is something you should understand; God likes it when you speak to him. He loves the interaction. It is through Prayer that you are able to talk personally to God. Some elements of prayer can be a form of worship. It is by prayer that an open door of communication is established with God. When you start to pray, let it begin with adoration. Tell Him how much you love and appreciate The Father, Son and Holy Spirit. Affirming your love to him is important. Many time our prayer start by asking for things. The best way is to start your prayer is to express God in what ways you love Him. When you pray your heart needs to be in the right place. Face it humans are sinful by nature. Confession is a form of acknowledgement of what is truthful. We should always confess our sins to God. It is better to confess that to let God “find out”. God is always faithful to forgive the sins we confess. Now let me add something different to the view to confession. Something that can add another dimension is the attitude of confession. That is to confess the greatness of God. You can confess your faith. How about confessing the truth! As a child of God you have an abundance of resources. He desires to shower you with all that he has to offer. The good thing to do is to thank Him for all the terrific things he does in your life. Thank God for everything and every circumstance. As I said earlier it is normal for Christians to pile on requests to God. God give me this, God give me that. Supplication is your petition for something. Prayer needs balance. Often times it is the supplication that Christians spend a bulk of time. It is fine to request. The Bible says to ask. Don’t make this your primary focus. Make prayers in accordance to God’s will. You will find that if you give Adoration, Confession and Thanksgiving prior to your supplication, you will be in the best attitude to ask for those things that are delightful to God. Be bold in your supplication to God. God has unlimited resources. Ask for things beyond yourself. 1 Timothy 3:16-17 All scripture is given by inspiration of God, and is profitable for doctrine, for reproof, for correction, for instruction in righteousness: That the man of God may be perfect, thoroughly furnished unto all good works. 2 Timothy 4:1-5 I charge thee therefore before God, and the Lord Jesus Christ, who shall judge the quick and the dead at his appearing and his kingdom; Preach the word; be instant in season, out of season; reprove, rebuke, exhort with all long suffering and doctrine. For the time will come when they will not endure sound doctrine; but after their own lusts shall they heap to themselves teachers, having itching ears; And they shall turn away their ears from the truth, and shall be turned unto fables. But watch thou in all things, endure afflictions, do the work of an evangelist, make full proof of thy ministry. We need to hear the word of God. And it is imperative to note that even the preaching is a form of worship to God. God what’s you to know him. He wants you to know him intimately. He wants you to know who and what he is. His relationship with you is vital. If you don’t know God, then how can you worship Him? For this reason he gave us preachers. Preaching is actually a chance to plunge into God’s word the bible and understand more about who he is. Discover how God works. In regards to worship the music, is not the warm-up to the message. Both are vital to the whole worship experience. Preaching and music complement each other. Okay, with all your heart mind and soul you are to give. Giving is one of the prime objectives of the Christian life. During the Christmas season we exchanged gift in my family. I would buy gifts for mom, dad, brother and sister. Trying to get the right gift was hard at times. My resources were limited when I was a child. Expensive gifts were often eliminated. This did leave the choices down quite a bit. To top this off, my parents already had a lot of stuff. In reality there was only a few things that I could give. With God it’s a lot like this. God possess the universe and everything in it. With God there is one thing we can give and that is our worship. This is one thing that He really enjoys from his people. Money is the first thing most think about when the topic of giving comes up. Yes it is true that giving money to the church is a privilege we all can partake. But, I want you to also know that it goes beyond that. It is your entire life that God wants. You have the amazing opportunity to give all your resources to God. This encompasses your time, your body, your mind and all your possessions. A true sacrifice of praise is when you give back to God what he has given to you. Matthew 26:26-29 And as they were eating, Jesus took bread, and blessed it, and brake it, and gave it to the disciples, and said, Take, eat; this is my body. And he took the cup, and gave thanks, and gave it to them, saying, Drink ye all of it; For this is my blood of the new testament, which is shed for many for the remission of sins. But I say unto you, I will not drink henceforth of this fruit of the vine, until that day when I drink it new with you in my Father’s kingdom. Communion is the greatest privilege a Christian can experience. During this time you have a truly close relationship with Jesus. This is a moment of oneness. It is time for the worshipper to bind with their Savior. It identifies the believer with Christ. Communion allows us to center on the greatest gift ever given to world. It is an instance to remember that Jesus death on the cross is the ultimate and final sacrifice for the sins of the world. As you can see there are a number of aspects to the worship experience. Each is as crucial as the other. The key for rich and fulfilling worship is balance. 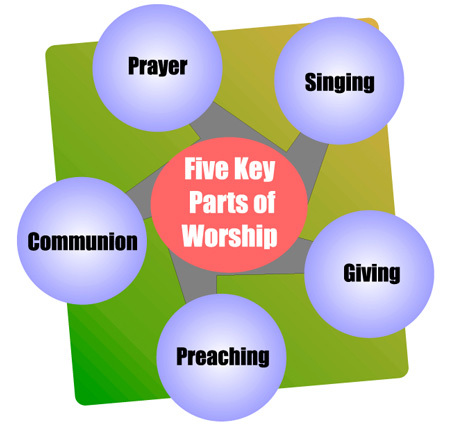 As you balance these five pieces in your worship service, you provide more opportunities for the worshiper.